If Mormons are Christian, then FLDS polygamists are Mormon. That’s really all the longer this article needs to be. But I’m pretty sure it’s guaranteed to cause the typical LDS member stress and elicit denials. How do I know this? Because I have made such a statement many times after hearing a member of the largest branch of believers in Joseph and his book insist that they are Christian. Why do such denials occur? I think its because members of The Church of Jesus Christ of Latter-day Saints would rather distance themselves from the likes of Warren Jeff’s. The typical LDS believer will declare their belief is most definitely not at all like the FLDS polygamist variant and they are prepared to detail all the reasons that off shoot doesn’t represent real Mormonism. But ask what it is that makes them Christian. The answer? Because the church is focused on Jesus Christ, heck its even in the name right? Kind of like how it’s in the name of The Church of Jesus Christ of Fundamentalist Latter-day Saints? You see it’s all in definition. Much like Christianity can represent a bunch of people that generally accept most or some of the Bible and the divinity of Jesus. It’s pretty easy to see that Mormonism can equally represent a group of people that believe in the divine mission of Joseph Smith and the Book of Mormon he produced. If you are not gonna allow the Christian to say you aren’t really Christian because of differences in doctrinal assertions and beliefs other than those two basic reasons. Then if you are playing fair, rejecting Warren Jeff’s Mormonism on the same premise, well… isn’t fair. 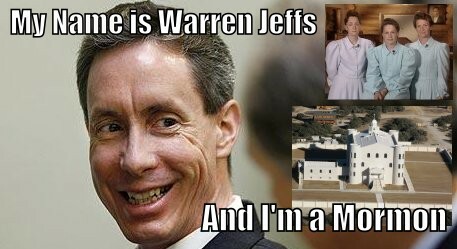 Maybe you should think for a minute about just how Mormon Warren Jeff’s is before you reply.